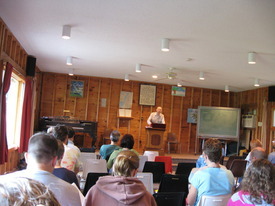 © Trevor 2012Many who have attended the Fryeburg New Church Assembly know that the morning lecture program is a long standing feature of every two-week August summer session. I had long wondered why that antique phrase, “The Lecture Program,” was accepted as apt, with no hint of being out of step in today’s increasingly interactive speaking and listening style. The answer lies in the Assembly’s hidden roots that began to grow in Michigan, and later in the Boston area, yielding their first fruit in the summer of 1921. There are five dates by which I locate the roots of that hidden history: February 8, 1831; the summers of 1898 and 1902; June 19, 1919; and a September day in 1920. 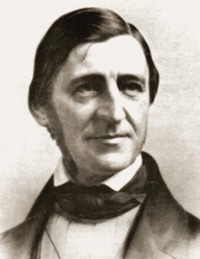 February 8, 1831, Ralph Waldo Emerson’s young wife died. The loss led her grieving husband to question his faith and the teachings of the church he served. He left his position as minister of a Unitarian Church in Boston to begin his legendary lecture tours in the Boston area and beyond. He spoke from a lectern over 1500 times between 1833 and his death in 1882. “The lecture” entered the vocabulary of nineteenth century New England by providing a new form of educational engagement and social entertainment. 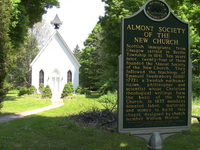 of the New Church to Almont, Michigan, a New Church Scottish settlement some sixty miles north of the city. Rev. E. J. E. Schreck was there to conduct a funeral. Noting the need for other pastoral services, Rev. Schreck returned later in the summer (and subsequent summers) to conduct Sunday services, make pastoral visits on his bicycle, and teach classes that were to become the Almont New Church Summer School (later renamed Almont New Church Assembly). In the summer of 1902, after a rapid expansion of his © FNCA 1925summer class attendance, Rev. Schreck left for Chicago, and Rev. John Whitehead (who is this writer’s great-grandfather) and his family moved to Detroit. Rev. Whitehead came as both pastor of the Detroit Society and director of the Almont Summer School, where a summer lecture program began to thrive. Though the Whitehead family moved back to the Boston area in 1907 (so that his children could be educated at the New Church School in Waltham, Massachusetts), Rev. Whitehead began in earnest to develop the lecture as a means of conveying New Church views to a general public receptive to new theological ideas. In particular, he introduced the inner sense of the Bible, which was received by biblically literate and curious audiences as a solution to problems encountered in their reading of its literal sense. Rather than serve a local congregation, Rev. Whitehead applied to the Board of Missions to further develop his commitment to a lecture program beyond the churches in the Boston area. He began a more than fifteen year career as lecturer in the Boston area, giving hundreds of lectures in Boston, New Bedford, Lowell, Salem, and Worcester, explaining the Bible in light of New Church principles. 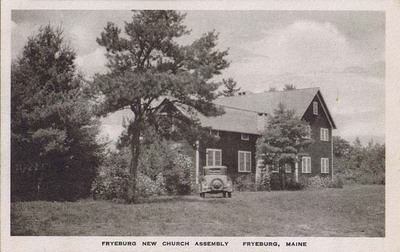 The search for the hidden roots of the Fryeburg New Church Assembly and its lecture program shifts to an event on June 19, New Church Day, 1919. On that day, © FNCA 2011Louis A. Dole and Anita Sturges were married in Urbana, Ohio. Rev. Dole was President of Urbana College, and a professor of Philosophy. Anita Sturges had left a promising career at the University of Chicago to become, at the behest of her sister Alice, a teacher at Urbana College. Alice subsequently invited her sister to join her for a week at the Almont New Church Summer School, where she heard lectures on correspondences that resulted in a change of her life direction. From a career in music, she decided to work for the New Church. Newly confirmed in the New Church, Anita Sturges promptly caught the attention of Louis Dole, and they were married within the year. where Rev. 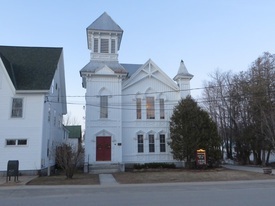 Dole was to serve the Fryeburg New Church as its pastor. Louis and Anita Dole (who are the parents of Rev. 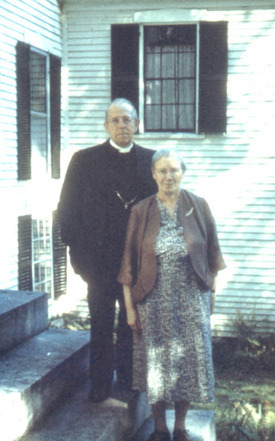 Gertrude Dole Tremblay, Louise Dole Woofenden, and Rev. Dr. George F. Dole) added their bright minds and youth to the longtime desire of the now aging Rev. John Whitehead: to found a summer school in Fryeburg. The first lectures were delivered in the summer of 1921. © FNCA 2014Ground was broken on the present site in the summer of 1928, and by the summer of 1932 there was a large building for overnight accommodation, meals, and lectures. 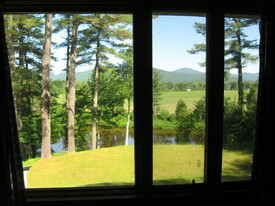 In the early thirties, cabins were built along the high bank overlooking the Saco River with a view to the White Mountains of New Hampshire beyond. Having looked back into its hidden history, I understand that the Fryeburg New Church Assembly Lecture Program reflects a tradition of the spoken word and lectures as a cherished means of conveying Swedenborgian principles that are alive and relevant. The buildings are still rustic, and the somewhat antique sounding “Lecture Program” is still quintessentially apt. © Trevor 2015Many who have attended over the years and those who have yet to experience the mountains in the distance and the river flowing beyond the bend can look forward to an exploration of the inner sense of Scripture, inner levels of the mind, and spiritual living in casual conversation and in the morning lectures. © Nancy F. Little 2011There are those lecturers who speak for thirty minutes, and then respond to questions and comments. Others include give and take from the audience as they gradually develop their ideas. 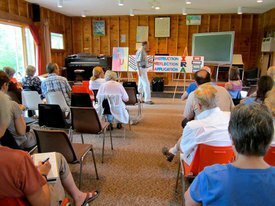 My listening tells me that both styles are welcomed, and that each grows from the hidden roots of the Fryeburg New Church Assembly and its long-standing Lecture Program. © Nancy F. Little 2012Rev. 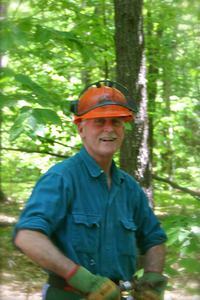 Dr. Gardner Perry is a core lecturer at the FNCA, and served for six years as our Camp President from 1990-1995. As of this writing, he is also currently serving as chair of the Council of Ministers of our national denomination, the Swedenborgian Church. He is a direct descendant of Rev. John Whitehead, one of the original founders of the Assembly and is the fourth generation of his family to attend.